Contractor - Cleland Construction Co., Inc. The bridge abutment approaches for the widening of the Lady Island Bridge were underlain by approximately 40 feet of very soft silt and clay. 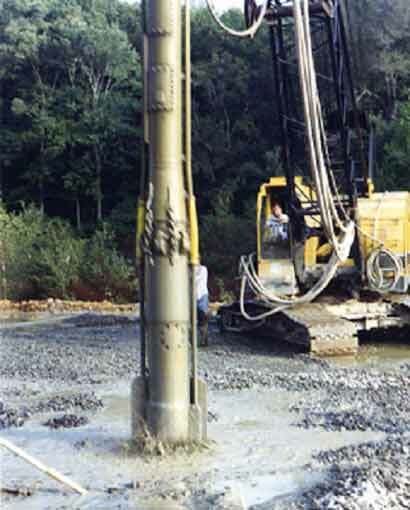 Stone columns were specified to increase the overall shear strength of the soil in order to prevent a shear failure or mud waving into the river as the embankments were raised. A secondary benefit of the stone columns was to reduce anticipated settlement in the soft clay and silt stratum from the weight of the new embankments. The stone column design called for a minimum column diameter of 3 ½ feet and to be installed in a triangular grid with spacings varying from 7 feet to 10 feet on center. The stone columns were installed with the wet process, due to the tendency for the dry bottom-feed technique to remold the soil and actually reduce the strength and compressibility properties of the soil. The work was performed in two stages so that two lanes of traffic could remain open at all times.